It was a case of anything you can do I can do better on Day Two at Trent Bridge as Marcus Trescothick smashed an unbeaten 117 to get Somerset up to 244-3 at the close. That was in reply to Nottinghamshire’s 401 all out as Steven Mullaney equalled his first-class best of 165 and Craig Overton took four wickets to finish off Nottinghamshire. Mullaney continued 161 not out after batting all of Day One and levelled his top score of 165 by clipping Overton for four early on Day Two. 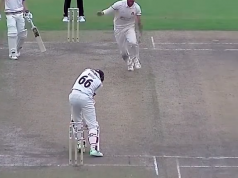 But he wasn’t to keep the Somerset paceman out the wickets for much longer as he found the edge which was safely held by Ryan Davies behind the stumps. Mullaney was out for 165 from 276 balls, but Luke Fletcher wasn’t hanging about and crunched Tim Groenewald through the covers shortly after in what was a well contested first half hour. It ended in two wickets for the visitors as Overton bagged his second when a short ball was too good for Samit Patel, only fending to James Hildreth at midwicket for 15. Fletcher was well on his way on Day Two with two more quick boundaries but after a partnership of 41 with club captain Chris Read, Jim Allenby struck with an important wicket as he dismissed Fletcher for 32 to leave the home side 377-7. That was to become 377-8 when Jack Leach struck with the next ball of the innings to remove Read for 15 in the batsman’s first Championship game since May. Nottinghamshire found themselves 396-8 at lunch after a dominant morning from Somerset’s bowlers that saw four wickets go down for just 65 runs in the session. Somerset were to wrap up Nottinghamshire’s innings the other side of the break as Overton struck twice more, Brett Hutton and Harry Gurney both nicking behind to leave Overton with 4-54 and Nottinghamshire 401 all out. 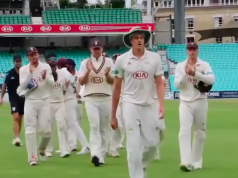 Trescothick and Johann Myburgh set about Somerset’s innings in rapid fashion as they raced to 38-0 in six overs and despite Fletcher adamant he had Trescothick caught behind, the former England opener was unmoved. Somerset’s hundred came up in the 21st over from just 124 balls as both openers found themselves in the mid-40s with a race on to a half-century. That sprint was won by Johann Myburgh who reached his 50 from 69 balls with ten boundaries, whilst Trescothick had run just two of his runs when he reached his 50 from 60 balls with 12 fours. However with Somerset cruising at 123-0, Imran Tahir struck in typical fashion, bowling Myburgh for 54 before the visitors reached 131-1 at tea. Chris Rogers passed 25,000 first-class runs just after tea whilst Trescothick smashed Tahir over midwicket for six at the other end before he surpassed a hundred for the 49th time in Somerset colours, moving joint top with Harrold Gimblett in the all-time list for the West Country club. 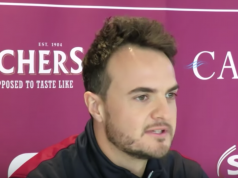 That was his first-ever century at Trent Bridge, coming from 122 balls and after a partnership of 101 with the Australian Rogers, Gurney made the breakthrough as Somerset’s captain was caught down leg side for 48. Two became three as Hildreth was bowled by Gurney four overs later, but Trescothick and nightwatchman Leach saw Somerset through to the close at 244-3 with Trescothick still there on 117 and Leach on one from 22 balls, whilst Gurney boasted figures of 2-52 from 16 overs.